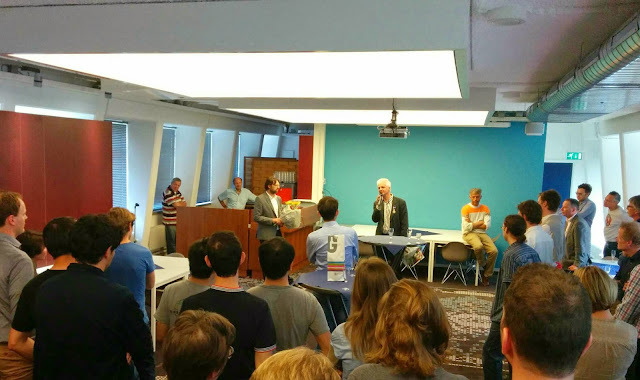 This morning we at the Applied Physics of TUDelft heard the wonderful news that two of our physics faculty members have become knighted with the title "Knight in the Order of the Netherlands Lion." Congrats Cees Dekker and Leo Kouwenhoven! In this blog I have posted one of the earliest reviews on Majorana fermions, here and here and here right after Leo's presentation at March Meeting 2012. I remember that day when in Boston Conference Center in one of its parallel sessions, in a small room I was sitting on the floor in front of the first row of chairs, and was listening to Leo's presentation. The room was full of audience. Below is the photo I took from the small party we had this afternoon in our department. Cakes were decorated by their photos! The speaker indicated that they received their medals this morning in Den Haag and added they are allowed to wear their Lion medals only today until the midnight! One funny thing happened was that at the middle of a friendly speech Leo wanted to say something in praise of the audience and he put words in a funny way and refer to us as non-Lion people! Apparently you are much ahead of Dutch people in breaking news on the web! HI Mark, In general I agree, dutch news in English is a bit slow in this country but thanks to google translate. The only trouble is that you cannot search for something in language A that is originally written in language B. Does google know this? !